↑ "Benito Juarez". Encyclopedia of World Biography. Retrieved 18 February 2011. 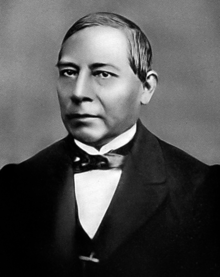 ↑ "Benito Juárez (March 21, 1806 – July 18, 1872)". Banco de Mexico. Retrieved 18 February 2011. ↑ 3.0 3.1 "Juárez' Birthday". Sistema Internet de la Presidencia. Retrieved 2009-03-23. ↑ Stacy, Lee, ed. (2002). Mexico and the United States. Vol. 1. Marshall Cavendish. p. 435. ISBN 978-0-7614-7402-9. ↑ "Juárez, Benito, on his early years". Historical Text Archive. Retrieved 2009-03-23.